Fractals are objects that exhibit similar structure on different scales. They abound in the natural world, from clouds to mountains, coastlines to trees, even our own circulatory system. 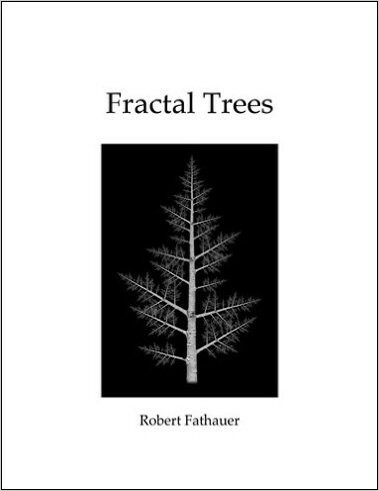 In this volume, by combining photographic imagery with iteration, the mathematical process at the heart of fractals, Robert Fathauer explores his unique vision of a nature that is even more fractal than the real world. These creations include a fern-like tree built from the stem of a rose bush, an infinite collection of spirals formed from the skeleton of a cholla cactus, and a tree whose outline resembles a maple leaf. Thirteen different trees are shown in two page spreads, an example of which can be seen here. Six randomized fractal trees are shown as well, two of which are shown here. The book also includes a section on the method used to create the trees and notes on the individual trees. In "Fractal Trees", mathematics and art unite to yield images that are intricate and complex, while retaining simplicity and grace. Included with the book are four classroom worksheets that teachers can copy, covering branching of fractal trees, trees in nature, infinite series, and fractal dimension.